Karen Millen Soft Denim dress Uk 8. although in my opinion its more a size 6 in the bust area. Lovely v neck neckline with darts at the bust and drop waistband with a full skirt for a flattering look. There is an invisible zip down the back. Beautiful scalloped lace edge at the bottom. The dress will probably sit over the knee/on the knee depending on how tall you are! Female Wrangler Denim Dress which can also be worn as a Jacket. Condition is Used. Item is a one off. Quilted style patch work on the shoulders and collar. 3 usable zips not just for show. If you wanted to wear with a belt there are loops available to do so. American style patch work flag on the right sleeve. Very comfortable and trendy. Nice and figure hugging if you like to show off you physique. It is a size 14UK. This is a Joules short sleeve simple navy blue shift dress. It is made in a structured soft navy blue self pattern cotton semi-fitted shift style dress. The dress is a pull on style with rear zip fastening, it cuts approx just below the knee length. Hi I have this beautiful dress its suitable for Evening part /prom/birthday/engagement/to attend wedding please note for the size measurement Size S China will fit size S/ 8 UK thanks. Model is 5ft2 and wears size 8-10 Clothes. REISS Nineteen Seventy-One Turquoise Blue A Line Floaty Special Occasion Dress Size 8 Good Worn Condition Please See My Listings For More Clothing And Other Items Pay No More Than £3.95 Postage On Clothing! 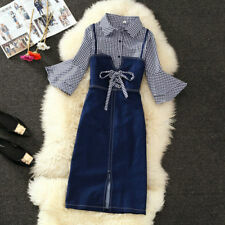 Fashion 2018 Summer Dress Denim Jeans Slim Dress Office Lady Work Casual Dress. Condition is New with tags. Dispatched with Royal Mail 1st Class.